The first violin part for Beethoven's Symphony No. 9 in F Major, Op. 93 – also nicknamed the Choral Symphony – has been edited by Stephen Geber, who served as the principal cellist of the Cleveland Orchestra for 30 years, from 1973 until 2003. Geber's bowings, fingerings and other editorial markings have been added throughout the score. Beethoven's Choral Symphony is the composer's ninth and final complete symphony. It is regarded as one of the greatest pieces – if not THE greatest piece – in western music ever written. Beethoven's Ninth Symphony was the first example of a major composer using voices in a symphony, hence its nickname. 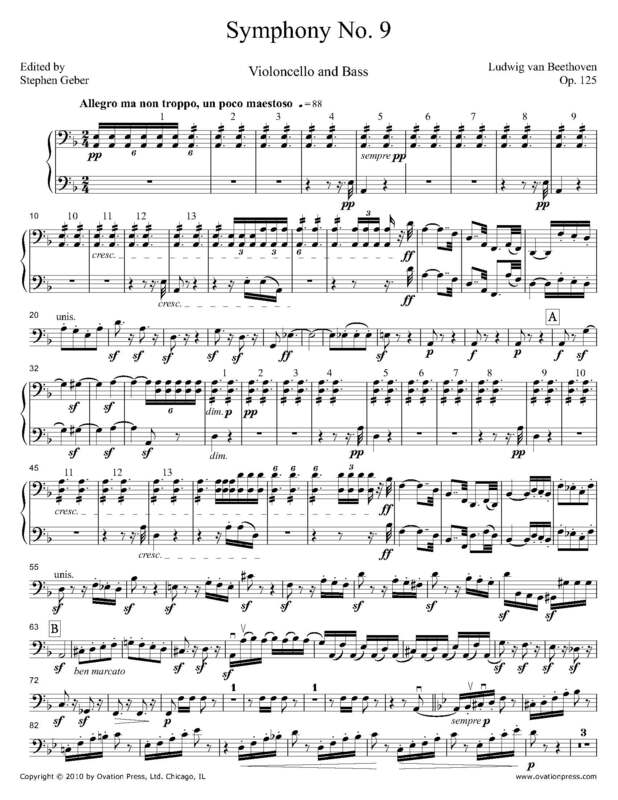 The text for the famous "Ode to Joy," sung in the final movement, was taken from a poem of the same name by Friedrich Schiller, with additions made by the composer. Today, it is one of the most played symphonies in the world. Although the Choral Symphony has the usual four movements, Beethoven changes the standard Classical pattern by placing the scherzo before the slow movement and immediately following the first, a stormy sonata form movement. The famous choral finale that is the fourth movement stands as Beethoven's musical representation of Universal Brotherhood. This movement is so incredibly monumental that it has been described as "a symphony within a symphony" which follows the same overall pattern as the Ninth Symphony as a whole. It is divided into the following sections, "pseudo-movements". Download and print the score today to gain access to expertly edited Beethoven Choral Symphony No. 9 cello fingerings and bowings from Stephen Geber!